Is the Cassadaga hotel haunted? 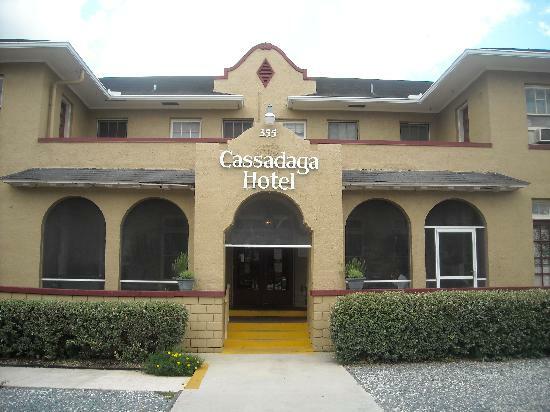 The cassadaga hotel was built in the late 1920's, the hotel is still open today and is the center of paranormal activity. it has been named "Psychic Capital of the World" due to its number of on site mediums which hold talks and seminars daily. The hotel is quite famous for its paranormal activity, there are claims that there are many ghosts at this location, and visitors are advised to bring cameras with them as many orbs and spirits have been captured here. Records of actual deaths or tragic events at this location are difficult to come by, but many ghosts are known to reside in areas were they didn't actually die. The hotel makes out that your pretty much guaranteed to experience something here, so it may be well worth a visit for any ghost fan.